This article is about the Mesopotamian Sun god. For the synagogue role, see gabbai. For the use in a Hanukkah menorah, see Menorah—Lighting. Shamash (Akkadian: Šamaš dUD 𒀭𒌓) was the solar deity in ancient Semitic religion, corresponding to the Sumerian god Utu. Shamash was also the god of justice in Babylonia and Assyria. Akkadian šamaš "Sun" is cognate to Syriac: ܫܡܫܐ‎ šemša, Hebrew: שֶׁמֶשׁ‎‎ šemeš and Arabic: شمس‎‎ šams. Both in early and in late inscriptions Shamash is designated as the "offspring of Nannar"; i.e. of the Moon-god, and since, in an enumeration of the pantheon, Sin generally takes precedence of Shamash, it is in relationship, presumably, to the Moon-god that the Sun-god appears as the dependent power. Such a supposition would accord with the prominence acquired by the Moon in the calendar and in astrological calculations, as well as with the fact that the Moon-cult belongs to the nomadic and therefore earlier stage of civilization, whereas the Sun-god rises to full importance only after the agricultural stage has been reached. The two chief centres of Sun-worship in Babylonia were Sippar, represented by the mounds at Abu Habba, and Larsa, represented by the modern Senkerah. At both places the chief sanctuary bore the name E-barra (or E-babbara) "the shining house"—a direct allusion to the brilliancy of the Sun-god. Of the two temples, that at Sippara was the more famous, but temples to Shamash were erected in all large centres – such as Babylon, Ur, Mari, Nippur, and Nineveh. According to the 1911 edition of the Encyclopædia Britannica the Shamash cults at Sippar and Larsa so overshadowed local Sun-deities elsewhere as to lead to an absorption of the minor deities by the predominating one, in the systematized pantheon these minor Sun-gods become attendants that do his service. Such are Bunene, spoken of as his chariot driver and whose consort is Atgi-makh, Kettu ("justice") and Mesharu ("right"), who were then introduced as attendants of Shamash. Other Sun-deities such as Ninurta and Nergal, the patron deities of other important centers, retained their independent existences as certain phases of the Sun, with Ninurta becoming the Sun-god of the morning and spring time and Nergal the Sun-god of the noon and the summer solstice. In the wake of such syncretism Shamash was usually viewed as the Sun-god in general. Together with Nannar–Sin and Ishtar, Shamash completes another triad by the side of Anu, Enlil and Ea. 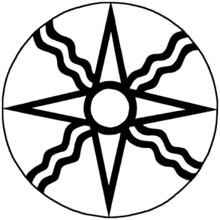 The three powers Sin, Shamash and Ishtar symbolized three great forces of nature: the Moon, the Sun, and the life-giving force of the earth, respectively. 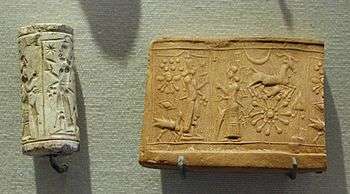 At times instead of Ishtar we find Adad, the storm-god, associated with Sin and Shamash, and it may be that these two sets of triads represent the doctrines of two different schools of theological thought in Babylonia that were subsequently harmonized by the recognition of a group consisting of all four deities. Another reference to Shamash is the Babylonian Epic of Gilgamesh. When Gilgamesh and Enkidu travel to slay Humbaba, each morning they pray and make libation to shamash in the direction of the rising Sun for safe travels. 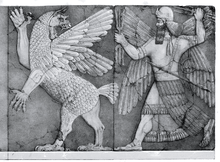 Gilgamesh receives dreams from Shamash, which Enkidu then interprets, and at their battle with Humbaba, it is Shamash's favor for Gilgamesh that enables them to defeat the monster. Shamash gifted to the hero Gilgamesh three weapons (the axe of mighty heroes, a great sword with a blade that weighs six score pounds and a hilt of thirty pounds and the bow of Anshan). The attribute most commonly associated with Shamash is justice. Just as the Sun disperses darkness, so Shamash brings wrong and injustice to light. 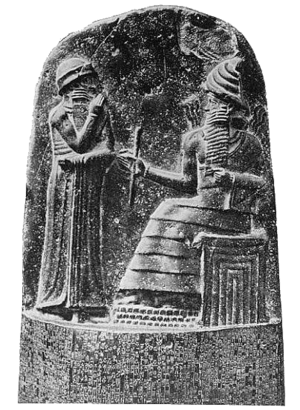 Hammurabi attributes to Shamash the inspiration that led him to gather the existing laws and legal procedures into code, and in the design accompanying the code the king represents himself in an attitude of adoration before Shamash as the embodiment of the idea of justice. Several centuries before Hammurabi, Ur-Engur of the Ur dynasty (c. 2600 BC) declared that he rendered decisions "according to the just laws of Shamash." It was a logical consequence of this conception of the Sun-god that he was regarded also as the one who released the sufferer from the grasp of the demons. The sick man, therefore, appeals to Shamash as the god who can be depended upon to help those who are suffering unjustly. This aspect of the Sun-god is vividly brought out in the hymns addressed to him, which are, therefore, among the finest productions in the entire realm of Babylonian literature. Shamash was historically associated with the planet Saturn. Morris Jastrow, Jr. identifies Shamash with the planet Saturn. Shamash is frequently associated with the lion, both in mythology and artistic depictions. In the ancient Canaanite religion, a "son of Baal Shamash", is known for slaying a lion (the son himself possibly an aspect of the god), and Shamash himself is depicted as a lion in religious iconography. In both the manga and animated series Shaman King, Shamash is the god-class spirit of Iron Maiden Jeanne, the leader of the X-Laws. In the Swedish roleplaying game Drakar och Demoner, "Shamash" is a god of truth, very important to the plot in "Konfluxsviten", a large and very popular scenario. ↑ Gods, Demons, and Symbols of Ancient Mesopotamia: An Illustrated Dictionary by Jeremy Black and Anthony Green (1992, ISBN 0-292-70794-0), p. 168. ↑ Jastrow, Jr., Morris (1910). "Sun and Saturn". Revue d'Assyriologie et d'Archéologie Orientale. Presses Universitaires de France. VII (4): 163–178. JSTOR 23283795. Wikimedia Commons has media related to Shamash. Chisholm, Hugh, ed. (1911). "Shamash". Encyclopædia Britannica (11th ed.). Cambridge University Press.